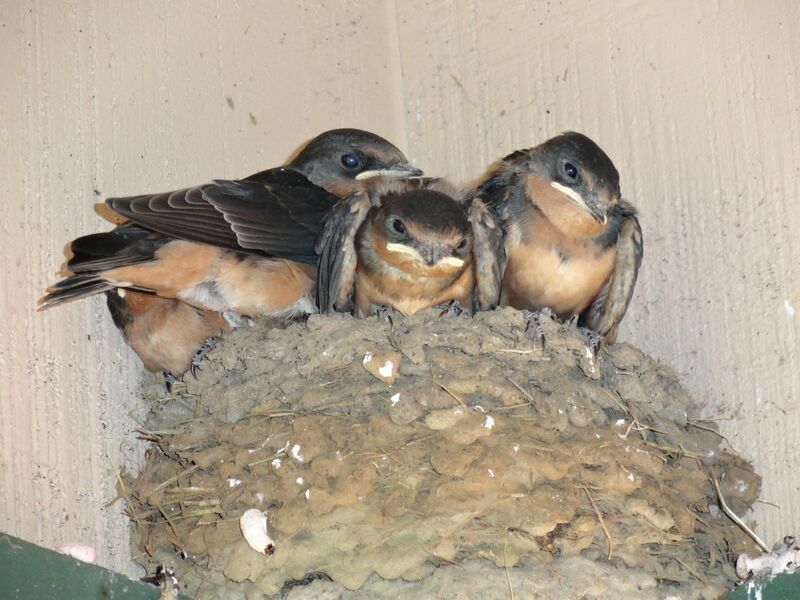 The parents that found lodging at this Oklahoma Bed & Breakfast asked the B&B’s owner to retreat and take a vacation from office work until these peepers could fly away. They nestled outside the main office on the underside of the deck roof. The protective parents of these barn swallows temporarily interrupted morning coffee and the sunrise view. 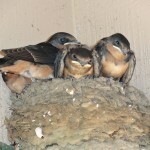 It was fun watching the progressive stages from nest building, to brooding eggs, to feeding these four big mouths. Any attempt to occupy their space was confronted with courteous but concerned aerial persistence. Today was the first “proud parent” moment (so to speak) as we were allowed to see a “pre-flight” premier view at the next generation of big mouth bug catchers without confrontation. There were three hovering visitations during this photo session. It will be remembered best in the eye to eye contact moments that expressed a hopeful trust between us. Although the four centers of attraction were oblivious to our visit but responded with open mouths at every approach of the courteous parents. The four were never fed during the photo shoot. We accepted it as a formal introduction, although names were never exchanged :-). Genny and Chef “What’s His Name?” vacationed at Lake Tenkiller for more than 15 years. At their special Lake Tenkiller lodging location they enjoy sharing their home, life stories and love of the lake with their guests. CLICK HERE to explore their website. This entry was posted in Events, General, Lake Tenkiller, Lake Tenkiller Lodging, Oklahoma B&B, Oklahoma Family Vacations, Oklahoma Retreats, Oklahoma Vacation, Summer, Terrapin Peak Bed, Breakfast & Beyond and tagged Barn swallows, Bed & Breakfast, Lake Tenkiller, Lake Tenkiller lodging, Oklahoma B&B, relaxation by Genny. Bookmark the permalink.